US NEWS: Netflix to stream Mad Men in $90m deal | What Hi-Fi? One of our favourite TV shows, Mad Men, is to be streamed on Netflix in a deal said to be worth around $90m (£55m), according to The Wall Street Journal. The online video service has secured the rights to all seven series of the show for around $1m per episode after signing a deal with producer Lionsgate. From July, viewers will be able to stream the first four series. The remaining three series, which are still to be made, will be available to stream once they have aired on US cable channel AMC. In the UK, the fifth series has been snatched from the BBC by Sky which will broadcast it on its premium Atlantic channel. 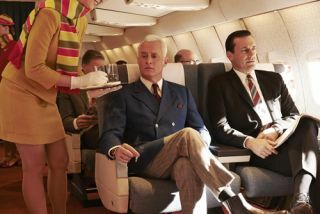 Production on series five was delayed due to a dispute between the show's creator, Matthew Weiner, and the producer and US broadcaster, but this has now been resolved. It will go into production this July and air in the US from March 2012. Last month Netflix signed another deal with film studio Miramax to stream its library of more than 700 films, including Pulp Fiction and Kill Bill.